It’s fresh, it’s kicky and it’s ready quickly. 1. Sauté onion in olive oil till they begins to brown. 2. Add cumin and sauté 2 minutes further. 3. Add pineapple tidbits and juice, garlic, red pepper flakes and salt and continue sautéing for 5 minutes. 4. 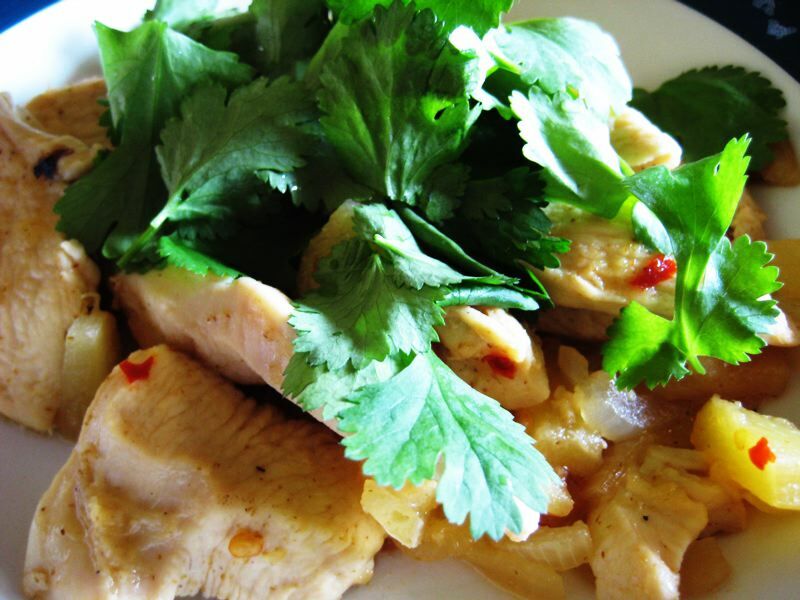 Add sliced chicken, cover and simmer on medium until fully done, 10 – 15 minutes. Top with plenty of fresh cilantro leaves to serve. Found your website by a run of great luck! I tried this last night and it is fantastic! I used fresh pineapple and thought I’d have to add water, however it was fine without it 🙂 Next time though, I’d reduce the red pepper flakes by half as it was very spicy for my tastes – although my hubby loved the spice level! Today I’m making your bbq #2 sauce….it’s already tasting great, my mouth is already watering! I’m pretty new to SCD (only about 3 months in) so I am definitely ready for some flavour! Looking forward to more from you in the future! Thank you for the kind words. I’m glad you enjoyed it. Oh my gosh this was delicious! I’m new to SCD and haven’t found many recipes that both the hubby and I thought tasted very good. This is a keeper! We love your Yonana muffins, too. I’m so glad you liked it! Thanks for letting me know.